1 How to brew a fresh rose hips? 2 How to make a dry briar? Rosehip - a wonderful plant. It is used in medicine and pharmacology, perfumery, Food Industry. Application finds its roots, seed, flowers, leaves and, of course, fruit. At home, known infusion or decoction of the fruit thereof. It is used simply as a pleasant drink, and as a prophylactic to saturate the body with vitamins, especially vitamin C during epidemics of influenza and acute respiratory infections. Infusion of rose hips was used for centuries as a remedy for scurvy, by malokroviya, inflammation of the kidneys, as a good remedy for urolithiasis, actively get rid of the sand, for rapid wound healing and tissue regeneration, infusion is able to reduce vascular fragility, helping to improve their elasticity. How great natural antioxidant he fights with aging organism and is prophylactic against the occurrence of tumors. 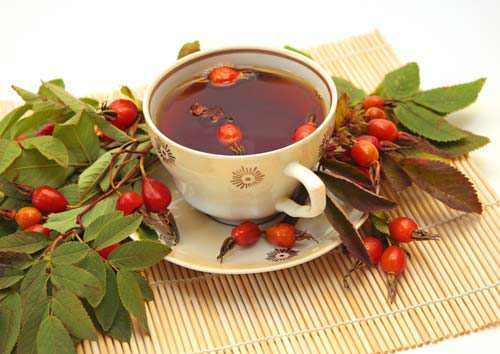 That is why it is very important to prepare the infusion or decoction of rose hips, order to preserve all the nutrients. For welding can be taken as fresh, and dried fruits. But the ways of brewing at the same time will be somewhat different. How to brew a fresh rose hips? Fresh fruit contain a large amount of valuable substances and vitamins. To save them as much as possible, The brewing is best to use a thermos with a glass, but not with a metal flask. Take a soft water, perfect - bottled, negazirovannuю. First of all, We prepare the fruits, shall wash their, cut and remove the internal villi, so they do not fall into the infusion. Then stretch our fruits well and put in a thermos, the rate of 1-2 ch.l. a glass of water. Fill their pre-boiled water, then cooled to about 60aboutWITH, it is necessary to preserve some minerals, and especially vitamin C, which is destroyed at higher temperatures. Thermos lid and insist half an hour, then filter, and the remaining content is placed in a pan and pour boiling water on the basis of 2 ch.l. on 0,5 l. water. Put the pan on low heat and boil the mixture for about a quarter hour, then carefully we filter. Infusion of the thermos, and the resulting broth mix, add sugar or honey to taste. This method allows to extract from the fruit of vitamin C at a lower temperature, and then the rest of the nutrients, which can only be obtained by boiling raw materials. How to make a dry briar? Dry rose hips can brew, preliminary grinding in the mill or blender, but it is no longer necessary to remove the dry hairs. Further, all steps are repeated, as well as the fresh rosehip, but, and filled in a thermos with Bay water temperature 60aboutWITH, insist a long time - from 45 minutes to hours. The infusion filter the, and the resulting residue fill with boiling water and half hour boil, we filter, mix with the infusion from a thermos, Sweetening and drink. Brewed whole fruit and dried rosehip. In this case, fruit is placed into a thermos, pour water (+60aboutWITH) and insist on 6 to 12 hours. You can brew briar night, and in the morning to drink a useful infusion. If we add some new fruits in a thermos to the old, the infusion can be continued up to three days, Then clean the thermos and prepare a new batch of fruit. Since the infusion of rose hips is choleretic, it should not be applied to patients cholelithiasis. Also in exacerbations of disease of the gastrointestinal tract, allergies, tromboflebyte.